The term “Internet of Things” (IoT) is being loosely tossed around in the media. But what does it mean? It means simply that data communication, like Internet communication, but not necessarily Internet Protocol packets, is emerging for all manner of “things” in the home, in your car, everywhere: light switches, lighting devices, thermostats, door locks, window shades, kitchen appliances, washers & dryers, home audio and video equipment, even pet food dispensers. You get the idea. It has also been called home automation. All of this communication occurs autonomously, without human intervention. The communication can be between and among these devices, so called machine to machine or M2M communication. The data communication can also terminate in a compute server where the information can be acted on automatically, or made available to the user to intervene remotely from their smart mobile phone or any other remote Internet connected device. Another key concept is the promise of automated energy efficiency, with the introduction of “smart meters” with data communication capability, and also achieved in large commercial structures via the Leadership in Energy & Environmental Design program or LEED. Some may recall that when Bill Gates built his multi-million dollar mansion on Lake Washington in Seattle, he had “remote control” of his home built into it. Now, years later, Gates’ original home automation is obsolete. The dream of home automation has been around for years, with numerous Silicon Valley conferences, and failed startups over the years, and needless to say, home automation went nowhere. But it is this concept of effortless home automation that has been the Holy Grail. But this is also where the glowing promise of The Internet of Things (IoT) begins to morph into a giant “hairball.” The term “hairball” was former Sun Microsystems CEO, Scott McNealy‘s favorite term to describe a complicated mess. In hindsight, the early euphoric days of home automation were plagued by the lack of “convergence.” I use this term to describe the inability of available technology to meet the market opportunity. Without convergence there can be no market opportunity beyond early adopter techno geeks. Today, the convergence problem has finally been eliminated. Moore’s Law and advances in data communication have swept away the convergence problem. But for many years the home automation market was stalled. The other problem is currently the center of this hairball, and from all indications is not likely to be resolved anytime soon. It is the problem of multiple data communication protocols, many of them effectively proprietary, creating a huge incompatible Tower of Babbling Things. There is no meaningful industry and market wide consensus on how The Internet of Things should communicate with the rest of the Internet. Until this happens, there can be no fulfillment of the promise of The Internet of Things. I recently posted “Co-opetition: Open Standards Always Win,” which discusses the need for open standards in order for a market to scale up. 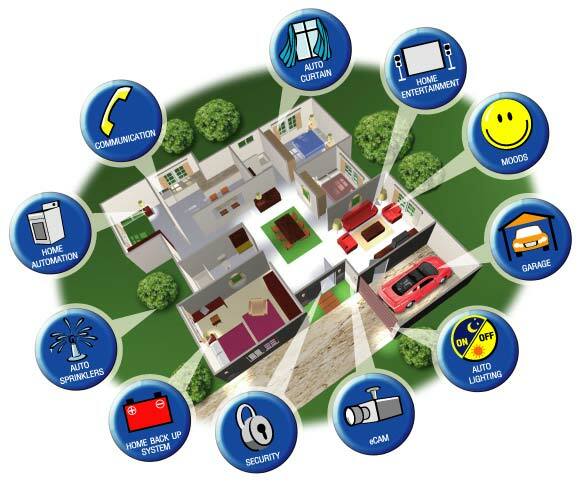 A recent ZDNet post explains that home automation currently requires that devices need to be able to connect with “multiple local- and wide-area connectivity options (ZigBee, Wi-Fi, Bluetooth, GSM/GPRS, RFID/NFC, GPS, Ethernet). Along with the ability to connect many different kinds of sensors, this allows devices to be configured for a range of vertical markets.” Huh? This is the problem in a nutshell. You do not need to be a data communication engineer to get the point. And this is not even close to a full discussion of the problem. There are also IoT vendors who believe that consumers should pay them for the ability to connect to their proprietary Cloud. So imagine paying a fee for every protocol or sensor we employ in our homes. That’s a non-starter. The above laundry list of data communication protocols, does not include the Zigbee “smart meter” communications standards war. The Zigbee protocol has been around for years, and claims to be an open industry standard, but many do not agree. Zigbee still does not really work, and a new competing smart meter protocol has just entered the picture. The Bluetooth IEEE 802.15 standard now may be overtaken by a much more powerful 802.15 3a. Some are asking if 4G LTE, NFC or WiFi may eliminate Bluetooth altogether. A very cool new technology, energy harvesting, has begun to take off in the home automation market. The energy harvesting sensors (no batteries) can capture just enough kinetic, peizo or thermoelectric energy to transmit short data communication “telegrams” to an energy harvesting router or server. The EnOcean Alliance has been formed around a small German company spun off from Siemens, and has attracted many leading companies in building automation. But EnOcean itself has recently published an article in Electronic Design News, announcing that they have a created “middleware” (quote) “…to incorporate battery-less devices into networks based on several different communication standards such as Wi-Fi, GSM, Ethernet/IP, BACnet, LON, KNX or DALI.” (unquote). It is apparent that this space remains very confused, crowded and uncertain. A new Cambridge UK startup, Neul is proposing yet another new IoT approach using the radio spectrum known as “white space,” becoming available with the transition from analog to digital television. With this much contention on protocols, there will be nothing but market paralysis. The advent of IP version 6, strongly supported by Intel and Cisco Systems has created another area of confusion. The problem with IPv6 in the world of The IoT is “too much information” as we say. Cisco and Intel want to see IPv6 as the one global protocol for every Internet connected device. This is utterly incompatible with energy harvesting, as the tiny amount of harvested energy cannot transmit the very long IPv6 packets. Hence, EnOcean’s middleware, without which their market is essentially constrained. Then there is the ongoing new standards and upgrade activity in the International Standards Organization (ISO), The Institute of Electrical and Electronics Engineers (IEEE), Special Interest Groups (SIG’s”), none of which seem to be moving toward any ultimate solution to the Tower of Babbling Things problem in The Internet of Things. The Brave New World of Internet privacy issues relating to this tidal wave of Big Data are not even considered here, and deserve a separate post on the subject. A recent NBC Technology post has explored many of these issues, while some have suggested we simply need to get over it. We have no privacy. Stakeholders in The Internet of Things seem not to have learned the repeated lesson of open standards and co-opetition, and are concentrating on proprietary advantage which ensures that this market will not effectively scale anytime in the foreseeable future. Intertwined with the Tower of Babbling Things are the problems of Internet privacy and consumer concerns about wireless communication health & safety issues. Taken together, this market is not ready for prime time. ISO/IEEE/IEC 21541-1-4 WG is currently doing exactly what this article is looking for, standardizing XMPP for federation of all the disparate protocols for IoT. You can read about the protocol on my blog at mholdmann.wordpress.com. There is a concerted effort underway within ISO and IEC to enable the Internet of Things, not so much as to speak in a single voice but moreover to harmonize in a chorus of voices. We could use your writing skills to advance these standards, but as of today we are not aware of your participation in any of these efforts. Please help to be part of the solution. I would very much enjoy working with others to resolve the Tower of Babbling Things problem, but I have no standing to participate in ISO/IEC. I do have specific experience in leading global standards efforts. I have been recently been in discussion with a few of the major corporate stakeholders in IoT, and the Chair of the Canadian Study Group, on this topic. This post summarizes the current situation as I understand it, and the lack of will of major stakeholders to join in such an effort. Without a groundswell of support from these stakeholders nothing will result. There are literally dozens of “standards,” that no one ever implemented.